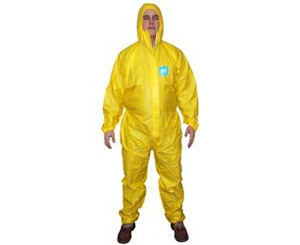 These coveralls offer exceptional particle and liquid spray protection. Low linting and has passed ASTM F1670/ 1671 testing for resistance to penetration of blood and blood borne pathogens. It's anti static treated and the optimized body fit improves wearer comfort and safety. Great to wear for applications such as paint spraying, pharmaceuticals, and mining. A two way front zipper with resealable storm flap cover.